(TORONTO) The Lexus GS is powerful and precise in performance and appearance. Advanced features, ground-breaking technologies and premium materials combine with a state of the art power train and finely-tuned handling to ignite the senses. The GS line up makes a lasting impression at first sight. Athletically-sculpted lines, the Lexus signature spindle grille and a low centre of gravity convey elegance and power while commanding attention. Inside, the driver and passengers are wrapped in a realm that is generous in dimension and welcoming in execution. Warm ambient lighting greets passengers on entry. Wood trim and soft touch materials set a relaxing tone. Premium details – such as the hand-crafted contrast stitching – delight the senses. 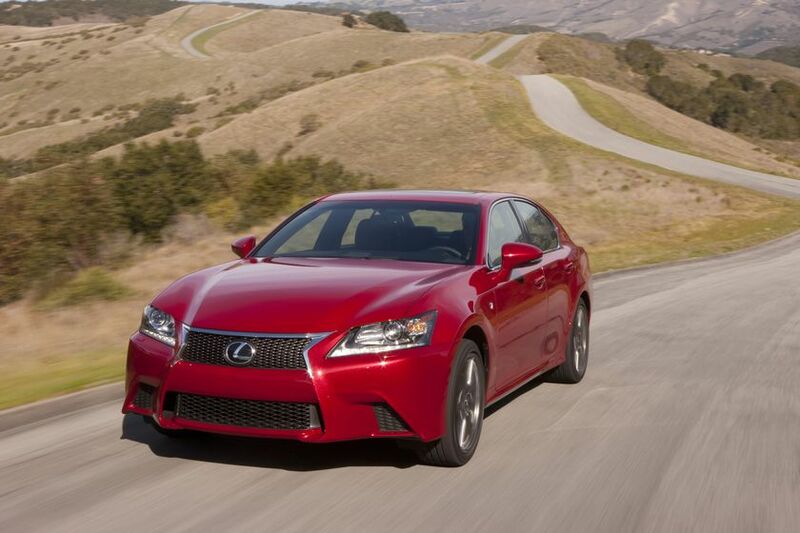 The 2014 Lexus GS lineup includes the GS 350 RWD, GS 350 AWD and GS 450h. Each is available in a range of trim levels, for a total of nine configurations. All feature luxury levels of performance, style, comfort and convenience, including: 12-speaker Lexus Premium Audio system with USB audio input, Bluetooth capability, XM Satellite Radio and steering wheel-mounted audio controls; dual-zone climate control; leather seat surfaces; 10-way power adjustable driver’s seat and front passenger’s seat; driver’s seat memory system; heated and air conditioned front seats; power door locks; 8-inch LCD display; multi-information display; outside temperature gauge; Lexus analogue clock with LED illumination; power windows with auto up/down function on all windows; woodgrain trim; aluminum scuff plates; leather wrapped steering wheel with paddle shifters; plenty of thoughtful in-cabin storage; LED map lamps and rear seat reading lamps; cruise control; integrated garage door opener; power rear window sun shade; 12-volt accessory power outlet; 18” aluminum alloy wheels with locks; power moon roof with sun shade; and more. No-compromise safety is standard on every Lexus model. The GS series is fully equipped with active and passive safety systems to protect the driver, occupants and other users of the road. Standard safety features include: 10 airbags; a back-up camera; Bi-Xenon HID automatic headlamps with the Lexus light control system; LED brake lamps and high-mount stop lamp; LED daytime running lights and clearance lamps; fog lamps; rain-sensing wipers; front windshield deicer; anchor points for child seats and child protector rear door locks; a tire pressure monitoring system; an onboard first-aid kit; and more – including active safety technologies such as Vehicle Dynamics Integrated Management, Vehicle Stability Control, Traction Control, Antilock Braking System with Brake Assist and Electronic Brakeforce Distribution, and Smart Stop Technology. Powered to thrill, the 2014 Lexus GS 350 RWD is built around a 306 HP, 3.5 liter V6 capable of propelling the vehicle from 0-100 km/h in 5.7 seconds. This powerhouse is matched to a highly-advanced eight-speed sequential shift automatic transmission that boasts a number of features first introduced on the Lexus IS F, including faster shifts and earlier torque converter lock-up. A available four-setting drive mode select control allows drivers to choose from Normal operation, the additional performance of Sport mode, the added efficiency of Eco mode, or the additional handling confidence of Snow mode. Models equipped with available F SPORT packages feature Sport S/S+ models to fully exploit the capability of the GS 350’s advanced drive train. The GS 350 RWD’s fuel efficiency rating is 9.0 L / 100 KM (city/highway combined). 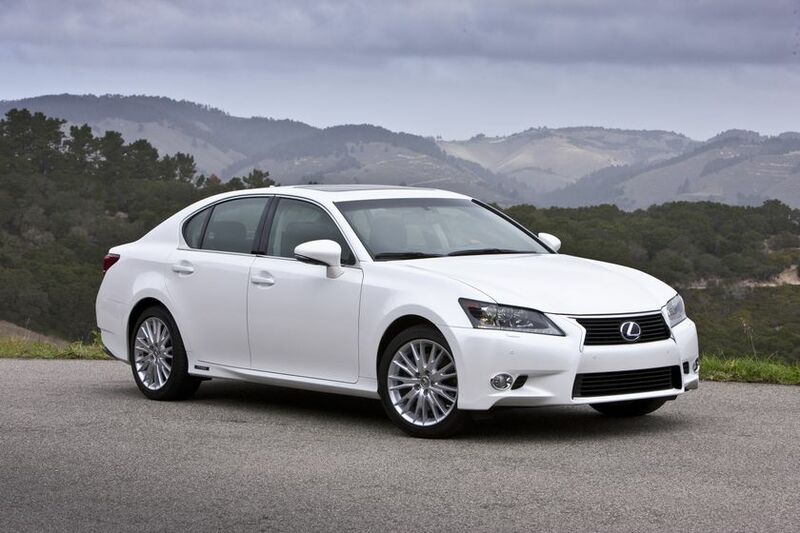 New for 2014, all GS 350 RWD models are standard equipped with an eight-speed ECT-i transmission and heated steering wheel. The Navigation Package adds: a navigation system with 12.3” LCD display. The F SPORT Package builds on the Navigation Package, 3-spoke F SPORT steering wheel; variable gear ratio steering with Four-wheel Active Steering technology; Drive Mode Select with S+ Mode; 19” F SPORT aluminum alloy wheels with summer tires; Front and Rear Adaptive Variable Suspension; 16-way power adjustable driver’s seat with added lumbar support; F SPORT leather seat surfaces; easy-close trunk; F SPORT front grille, rear spoiler, scuff plates and shift knob; aluminum sport pedals with rubber inserts; and more. The all-wheel-drive GS 350 features the same engine as its rear-wheel-drive cousin – plus an advanced, lightweight AWD system that automatically adjusts power transfer to optimize traction, stability and drivability while maximizing fuel efficiency. The GS 350 AWD’s fuel efficiency rating is 9.5 L / 100 KM (city/highway combined). New for 2014, all GS 350 AWD models are standard equipped with a heated steering wheel. The Luxury Package builds on the Navigation Package, adding: Drive Mode Select with S+ Mode; Woodgrain and leather-wrapped steering wheel; Front and Rear Adaptive Variable Suspension; High-gloss rims; rear seat climate control system; front passenger seat memory system; 18-way power adjustable front seats with butterfly headrests; premium leather seat surfaces; rear door glass sun shades; easy-close trunk; adaptive front lighting system; LED fog lamps; a tire pressure monitoring system with auto location; and heated rear seats. The Technology Package builds on the Luxury Package, adding: a 17-speaker Mark Levinson Premium Audio System; power folding mirrors; heads-up display; and the Blind Spot Monitor and Rear Cross Traffic Alert safety systems. The Technology Plus Package builds on the Technology Package, adding: Dynamic radar cruise control; the Lexus Pre-collision system; clearance and back-up sensors; and the Lexus Driver Monitoring system. The F SPORT Package builds on the Navigation System, adding: 3-spoke F SPORT steering wheel; Drive Mode Select with S+ Mode; 19” F SPORT aluminum alloy wheels with summer tires; Front and Rear Adaptive Variable Suspension; 16-way power adjustable driver’s seat including lumbar support; F SPORT leather seat surfaces; easy-close trunk; F SPORT front grille, rear spoiler, scuff plates and shift knob; aluminum sport pedals with rubber inserts; and more. Equipped with a second generation Lexus Hybrid Drive tailored to the vehicle, the 2014 Lexus GS 450h features a 3.5 liter Atkinson Cycle V6, high-torque electric motor and powerful hybrid battery plus sophisticated power management system. This combination delivers performance comparable to a 4.5 liter V8 with class-leading fuel efficiency at just 6.4 L / 100 KM (city/highway combined). Mated to a continuously variable transmission, the GS 450h can reach 100 km/h from a standing start in as little as 5.6 seconds. A four-setting drive mode select control allows drivers to choose from Normal operation, the additional performance of Sport S/S+ mode, the added efficiency o f Eco mode or the pure electric operation of EV mode (over short distances). The Navigation Package adds: a navigation system with 12.3” LCD display; a heated steering wheel; and more. The Luxury Package builds on the Navigation Package, adding: rear seat climate controls; a 17-speaker Mark Levinson Premium Audio system; tire pressure monitoring system with auto location; heated rear seats; premium leather seat surfaces; 18-way power adjustable front seats; rear door sun shades; easy-close trunk; adaptive front lighting system; LED fog lamps; and more. The Technology Package builds on the Luxury Package, adding: Power folding mirrors; heads-up display; the Blind Spot Monitor and Rear Cross Traffic Alert safety systems; dynamic radar cruise control; the Lexus Pre-collision system; clearance and back-up sensors; the Lexus Driver Monitoring system; and more. The 2014 Lexus GS 350 RWD, GS 350 AWD and GS 450h are now on sale at Lexus Dealers across Canada. For more information on features and specifications, visit www.lexus.ca/gs.